Special Containment Procedures: Samples of SCP-189 are to be stored in Cryo-containment Facility ██, with any surplus destroyed by incineration. Test subjects infected with SCP-189 are to be kept in a sealed containment chamber with an airlock that includes a chemical shower. Personnel interacting with test subjects must wear standard NBC hazard suits throughout their time inside the containment chamber, and submit to a chemical shower before exiting the airlock on their way out. When test subjects expire or are terminated, their remains must be sealed in an airtight container or body bag, which is subjected to the same chemical shower as the personnel carrying it out of the containment chamber, and disposed of by incineration. Staff members found to be infested with SCP-189 are to be quarantined according to the procedure outlined above for test subjects, and treated with anti-parasitic agent 189-A. See Document 189-█ for treatment procedure. If SCP-189 infestation is discovered on any individual or animal at a facility, all personnel and animals at that facility are to be inspected for the presence of SCP-189 as detailed in Procedure 189-█, any staff members treated as described above, any D-Class and/or non-SCP animals terminated and incinerated, and the facility subjected to a thorough cleaning with anti-parasitic agent 189-A. Should any cases of SCP-189 infestation be confirmed in persons or animals outside the Foundation, all those affected are to be immediately taken into custody and quarantined. Animals should be euthanised and incinerated, while humans are to be treated with anti-parasitic agent 189-A for the infestation, then administered Class C or B amnestics. Any individuals who may have been in close contact with the infectee(s) and/or entered their personal vehicle or place of residence should be checked for SCP-189 infestation and treated if necessary. Refer to Document 189-█ for suitable cover stories. Description: SCP-189 is a species of parasitic roundworm (tentative taxonomic classification [DATA EXPUNGED]) capable of infesting any mammalian life form. Infection most commonly occurs as a result of direct skin contact with one or more egg sacs. These egg sacs are covered with microscopic "hooks" similar to those on the cuticles of some species of nematode, which anchor the sacs to the skin's surface. Contact with sebum then prompts the eggs inside to hatch, at which time the larvae seek out and burrow into one or more nearby hair follicles. Once inside the follicle, the larva attaches itself at the base of the papilla and begins feeding off the capillaries supplying the papilla. Over the course of 2-3 days, the larva grows larger and develops into an adult. When it has fully matured, the new adult detaches from the papilla, severs the hair fiber from the root, and almost fully envelops the papilla and hair matrix. 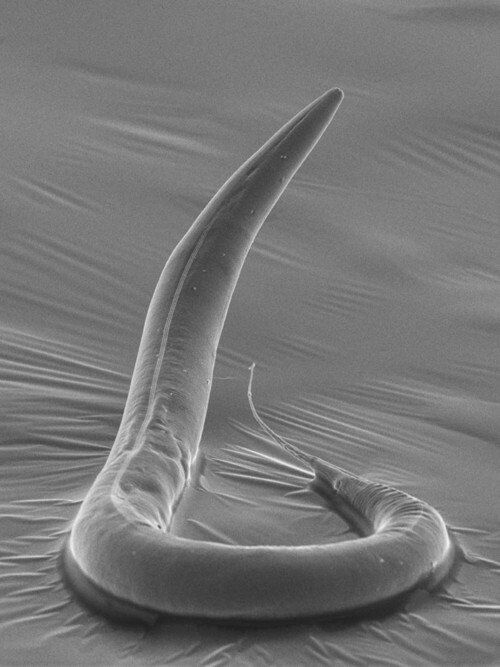 From this point forward, the worm feeds on the cells shed by the hair matrix (which would normally form the hair fiber), and begins to grow longer. Adult SCP-189 specimens grow only in length, extruding a "tail" which incorporate some of the pigments and keratin from the cells they consume into an outer cuticle. This, combined with the fact that the diameter of a specimen's "tail" is usually similar to that of the hair that would normally grow from the host follicle, causes SCP-189 to be visually indistinguishable from a normal hair, except upon microscopic inspection. However, some specimens will occasionally flex, coil and uncoil, and/or lash their "tail", particularly in response to tactile stimulation. The reason for this behavior is not currently understood, nor is why only some individuals behave in this fashion, though it has been proposed that [DATA EXPUNGED]. As with many other species of roundworms, SCP-189 is hermaphroditic, with both sets of genitalia contained in the "head" (the portion enveloping the papilla and hair matrix). Fertilized eggs are produced in groups of 1-3 and enveloped in a protective egg sac, which is then incorporated into the growing "tail". Egg sacs grow their microscopic "hooks" and the eggs typically mature by the time the portion of the tail containing them has extended approximately 1 mm beyond the surface of the host's skin. Once fully developed, the egg sac passes to the exterior of the organism's tail, becoming loosely embedded in its cuticle. At this point, if the egg sac is brought into contact with a suitable host surface (including the skin of the current host), it attaches to this surface and is pulled free from its parent. This is the primary method SCP-189 uses both to infect new hosts and to further infest the current host. The "tail" of an adult specimen of SCP-189 is no more durable than normal hair, and its "head" no more strongly attached to the host follicle. The "tail" can be cut or broken, or the entire organism pulled out, by any method that would similarly affect hair. Severed sections of an adult's tail can grow a new "head" and regenerate into a separate individual, but only if they can attach to a suitable host. The death of a follicle infested by an adult SCP-189 (or any other event that would cause the loss of that follicle's hair) causes that individual to detach from its host. Without a host, adult SCP-189 die within 1-6 hours. Mature eggs can remain viable for up to █ years after the death of their parent, and as such even dead adults can present a risk of infestation. When an infected host dies, any surviving adult specimens of SCP-189 continue to feed and grow, eventually burrowing into the host's tissues. Once decay begins, however, the specimen is killed by the toxins produced. Addendum 1: SCP-189 was first discovered 19██, when Dr. A████ F██████ (then unaffiliated with the Foundation) traveled to a remote area of the [DATA EXPUNGED] rainforest as part of a six-month biodiversity survey. Dr. F██████ brought Kara, his three-year-old pet golden retriever, along with him on the expedition. It seems likely that the dog was first infested some time during this trip. Regardless of when the infestation began, by the time Dr. F██████ and Kara returned to the United States it is believed that over 80% of the animal's follicles had been infested by SCP-189. Approximately ██ days after his return, Dr. F██████ was petting Kara when the dog's "fur" began to move. Recognizing the abnormal nature of the infestation, Dr. F██████ contacted Dr. I██ W███, a parasitologist, with an invitation to study the newly-discovered organism. It was when Drs. F██████ and W███ submitted a paper on SCP-189 for publication that the Foundation became aware of its existence, and immediately took Drs. F██████ and W███ into custody and seized all of their research materials. Both doctors were later recruited into the Foundation, with Dr. W███ becoming the lead researcher in charge of SCP-189, and currently stationed in [DATA EXPUNGED] investigating indigenous populations of SCP-189 for possible containment or eradication. Addendum 2: Since the Foundation first became aware of SCP-189, there have been ██ incidents of infestation outside the Foundation, resulting in ███ humans and ████ animals confirmed infected in various parts of the world. Continued monitoring is warranted to ensure that such incidents do not come to the attention of the general public.